We have all witnessed a new wave of innovation across various industries. Multiple new products are launched every day with a core focus on solving some of the most rugged business challenges and providing end users with instant gratification. One core focus of most product companies is to launch products faster to market. This gives them the competitive edge over other companies and also enables them to take an early mover advantage. There are various things that product companies need to consider for launching products faster such as early and continuous feedback of stakeholders, automation testing, test driven development, and so on. However, road mapping tops it all. Let us understand what is a product roadmap, benefits of a roadmap, reasons for having a roadmap and best practices. A product roadmap is a detailed plan that includes both the short-term and long-term business goals and ways to achieve these goals with specific technology solutions. A product roadmap can be developed for a new product or an existing product. Product owner along with other stakeholders formulate a detailed roadmap covering various planned steps of achieving the business goals. While defining the roadmap, product teams also align the priorities with business goals. The primary purpose of developing such a roadmap is to communicate the right directions, steps, and progress to all the stakeholders. It does not intend to showcase granular features of the product or a list of expected glitches. It is usually a myth that product roadmap is required only at the beginning of the product lifecycle. Roadmapping is a continuous process and should be taken care by the product management teams throughout the lifecycle of the product. Why is it quintessential to build a product roadmap? Pre-planning – Roadmapping helps product teams and technology teams to plan for their capabilities and resources in advance. This also improves the strategy. Find gaps – Product teams can easily find gaps in product and technology plans with the help of road mapping enabling them to focus on problems early. Prioritize investment – With the help of roadmap, it is easy to identify investment drives and prioritize investment in advance. Funds are mobilized for necessary resources basis the customer needs and technology requirements. Set milestones – Without a roadmap, it is not possible to set a realistic timeline. It also helps to set performance targets against industry benchmarks. Risk mitigation – As product roadmap is structured and provides a direction, it also contributes to mitigate the risks. Moreover, certain roadmaps also account for risk and contingency planning separately. Increase visibility – Product roadmap enhances the visibility of the project to all the stakeholders. Stakeholders can also provide feedback and help in improving direction setting. 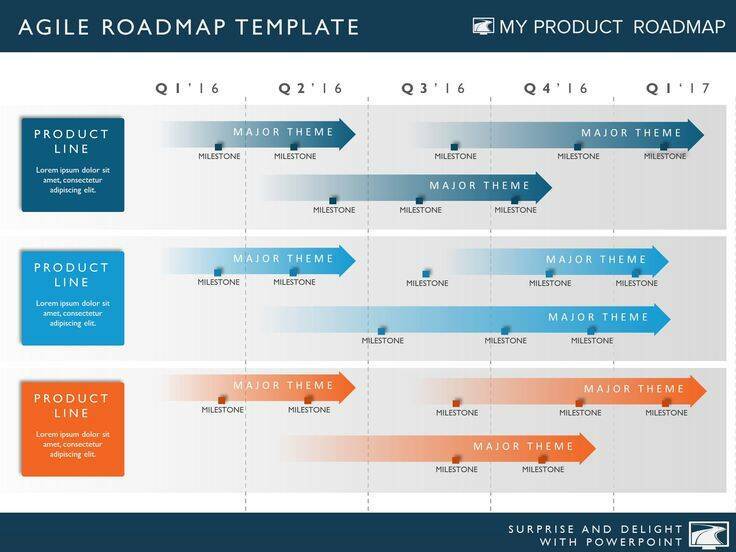 What are the different kinds of product roadmaps? 1. Market and Strategy: It provides a clear picture of the market segments that the company would like to target and how to penetrate in the said market with a strategy. 2. Technology: Technology roadmaps can help the organization assess its technology capabilities and current trends in technology. It also helps to plan out strategic initiatives into the future, such as migration from legacy system to new technology and rolling out software updates. 3. Visionary: Visionary roadmaps help to setup a product vision and obtain long-term buy-in and commitment from the stakeholders. 4. Platform Roadmap: It helps to roll out a core plan about the platform software as well as letting the stakeholders know about what will platform company delivers regarding products and development tool chain to partners. 5. Product (Internal & External): An internal product roadmap helps to communicate the priorities to internal project members whereas the external product showcase product competency to partners, customers and investors. How to build a product roadmap? While product roadmap is certainly important, it is challenging to prepare a robust roadmap. Outlined below are the key steps to follow for preparing product roadmap. The very first step is defining specific goals related to the product. A good product strategy comprises of five essential parts: SMART goals that are specific, measurable, achievable, realistic and timely, product vision of the organisation and initiatives that will help to achieve such goal. It also acts as a guiding framework and basis of entire product-life-cycle. Some of the questions this strategy should answer include (a.) Who are the end users? (b.) What problems would the product be able to solve? (c.) How it stands out from the competition? A roadmap is a high-level representation of the product. It is always a good idea to prioritize on the key activities in the roadmap. There are multiple prioritising tools using which companies can identify important tasks and make them visible to stakeholders. Short term weekly and monthly timelines for better clarity. A good roadmap is highly visual and helps to understand entire product cycle easily. Make sure that the visual representation is available to all the stakeholders so that they can share insights anytime they want and track the progress. Now that you are well-aware about roadmapping types and importance, let us walk you through some of the best practices to consider while developing a product roadmap. Refrain yourself from adding many details to your roadmap. Make sure you create a roadmap that is easy to interpret. People mix product roadmaps with release plans and epics. It is recommended to formulate high-level roadmap that describes key aspects of the product, milestones you expect to achieve and overall future as well as current goals about the product. Keep the focus on attaining goals through this roadmap. Eliminating dates from the product roadmap will help a product manager to focus on the bigger picture with more flexibility. However, this can be argumentative as some experts recommend showing dates in the roadmap. One solution to leave dates and still be definite is to have short, medium and long-term tasks listed in the roadmap. Most product companies that follow Agile methodologies continue to evolve and change requirements eventually. It is, therefore, crucial to review and measure the success of the roadmap at constant intervals. If there are changes, these changes should get reflected in the product roadmap. Listing out multiple features of the product will not result in a compelling product roadmap. It is, in fact, advisable to drive your focus towards themes, not features. A feature roadmap looks like a release map or a Gantt chart which has a limitation of not communicating a bigger picture and is moreover used for a planning project. On the other hand, a theme focuses on solving the customer problem. It helps to convey bigger picture promisingly.